As the first South American host, the 2016 Olympics in Rio are eagerly anticipated as an opportunity to attract tourists and business, as well as providing employment and training to assist the city’s economic growth. However, beyond the spectacle and perceived benefits of the event lies a darker interpretation, which implies that the Olympic games are an opportunity for cities to justify removing the poor to enable the accumulation of capital. The large-scale and forced displacement of Rio’s informal ‘favela’ settlements demonstrates how Olympic development enables cities to justify the removal of undesirable, poor and marginalised groups. After hosting the 2007 Pan-American games, Rio was awarded the role of 2016 Summer Olympics Host in 2009. Rio’s Olympic venues are spread over Copacabana Beach, Maracanã, Deodoro and Barra da Tijuca, which will host most of the Olympic venues, including the Olympic Village. Pre-Games infrastructure investment in these four areas is extensive, accounting for R$16.5 billion of the total R$29 billion budget in order to create what Gaffney describes as ‘sportive constellations’, referring to the tangible, physical elements of the Olympic Games. These ‘sportive constellations’ are perceived as an opportunity to assist economic development, as bid documents claim that the Games are ‘consistent with our long term major events strategy which will drive inward investment, tourism and promotion of Brazil to global markets’. A study by the University of São Paulo demonstrates the economic attraction of hosting the games, as it found that every US$1 invested will generate US$3.26 by 2027. Whilst a windfall is expected for construction, real estate and transport industries, the Games come at a cost to other groups. Bid documents promised to ‘seek a balance between economic considerations… and the promotion of social benefit in everything we do’. However, Rio’s swathes of informal housing, in which ‘763 favelas house 22% of the city’s population’ seem to have been overlooked in practice. A community news agency reports that 67,000 people have been evicted in Rio between 2009-2013 as part of Olympic developments. The Vila Autódromo favela is at the centre of displacement ahead of Rio 2016, as it occupies part of the main Olympic Park construction site. A former fishing village, Vila Autódromo ‘now occupies prime waterfront real estate in Rio’s growing upscale Barra da Tijuca neighbourhood’. Whilst the City now claims that this favela must be cleared in order to construct a road to enable access to the Olympic Park, it was previously overlooked during the bidding phase as ‘the settlement was […] digitally ‘brushed out’ of the […] presentation given to IOC [International Olympic Committee] delegates on the day of the award’, implying that favela resident displacement was hidden, and thus not a factor of the IOC’s decision to award the 2016 host role to Rio. ‘Eminent domain’, referring to the right of the state to seize private property for public use, has been used to demand the eviction of Vila Autódromo residents. Their displacement is legally justified as the state has resettled residents and provided financial compensation. However, Raquel Rolnik, UN Special Rapporteur on adequate housing, is critical of these justifications, highlighting two main concerns surrounding Olympic-caused displacement in Rio. Firstly, there is a lack of transparency, as communities are not warned in advance, ensuring that they cannot contest plans or propose alternatives. Secondly, provisions to mitigate the impact of displacement are insufficient. Financially, Rolnik claims that compensation is inadequate to purchase replacement housing, ensuring that the displaced are frequently left homeless. Resettlement locations are equally problematic, as the housing offered is often far from where residents previously lived. For example, a public notice in Vila Autódromo in 2011 announced that residents would be relocated to the Carioca Residential Park, one kilometre away, Mark claims that in practice, 8,600 of the 22,059 families displaced across Rio as a whole ahead of Rio 2016, have been moved to Minha Casa Minha Vida, 37 miles from Rio’s city centre. Therefore, Olympic developments are leaving Rio’s favela residents in precarious circumstances. Displacement is portrayed as unfortunate, but necessary to make room for the Games, yet Kumar claims that displacement is an explicit aim of Olympic development. He writes that displacement is ‘not simply an adverse side-effect, but goes to the very essence of why cities battle to host the Games’, implying that the ability to displace is a key attraction for potential Olympic hosts. Theresa Williamson, executive director of Rio-based NGO Catalytic Communities, which works with favela residents, believes that developers in Rio share this view, as they ‘see it [the favela] as an eyesore to have this community on the horizon or to even have to contemplate maintaining this community’. Residents have resisted a history of attempts to clear Vila Autódromo, including in 1993 and in 2002 ahead of the Pan-American games. This implies that Rio 2016 provides the long-awaited opportunity to enable the clearance of this favela. 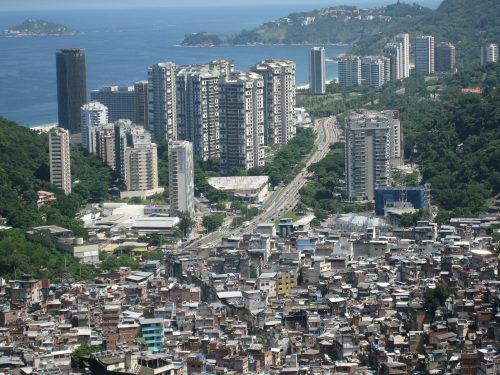 Post-Olympic plans for the Olympic site further indicate that removing favela residents and attract more affluent groups is the motivation for development. Readings indicate that after the event ‘1.2 billion metres2 (75% of the total area) will be transferred to the private partner to commercially exploit for residential, hospitality and business ventures’. Sim reports that there are plans, post-event, ‘to transform much of the Olympic Park into high-rise apartments, and the Olympic Village […] will […] be sold as residences’. Whilst this could be interpreted as an innocent attempt to maximise profit from construction, the extent of this transfer to private capital implies that post-Olympic profit-making is the primary aim of displacement. To answer the question of activists, who demand ‘Olympiadas para quem?’ [Olympics for whom? ], it seems that poor, ‘undesirable’ communities are being removed as a means to attract wealthier tourists, residents and business as a means towards Rio’s long term economic growth. As such, this profit-making focus implies that Rio’s Olympic developments are an example of what Marxist geographer, David Harvey, describes as ‘accumulation by dispossession’, a process in which assets are forcibly captured to create outlets for the expansion of capital. Accumulation by dispossession can involve ‘the commodification and privatization of land and the forceful expulsion of peasant populations’, as demonstrated by the acquisition of Vila Autódromo as an opportunity to remove favela residents. Moreover, the Vila Autódromo case resonates with Smith’s discussion of ‘revanchism’ in New York’s Lower East Side during the 1980s. Smith claims that alongside cultural re-branding and gentrification, which sought to attract more affluent residents, there was an explicit aim to evict squatters. Just as Smith claims that the violent clearance of Tompkins Square Park squatters was a middle-class reaction which sought to ‘re-take’ the neighbourhood from those who were perceived to have stolen the city, it seems that the eviction of favela residents from Vila Autódromo is a response to a perception that this community prevents the construction of infrastructure which would attract more affluent users. Similarly to Raco’s claim that revanchist measures which accompany urban regeneration target ‘particular social groups in an effort to sanitise space in the interests of capital accumulation’, Rio 2016 provides an opportunity to sanitise Rio’s favelas to enable higher-value uses. Therefore, Rio’s Olympic infrastructure developments are part of a wider effort to remove ‘undesirable’ groups in order to increase the capital-accumulation potential of urban space. However, it is not just for the 2016 Olympics that ‘undesirable’ populations are explicitly displaced as a means towards long-term economic growth. Malfas et al.’s claim that ‘the prospect of economic growth is the driving force behind bids for hosting the Olympic Games’ provides an anchor with which to interpret the common motivation for prospective Host cities. For example, the former Clays Lane housing estate in East London was subject to a compulsory purchase order, and is now the site of the Queen Elizabeth Olympic Park. In their research of Olympic-caused housing displacements, the Centre on Housing Rights and Evictions found that ‘in particular the poor; low-income earners; residents of public housing’ were disproportionately displaced for London 2012. Consequently, it appears that a revanchist theme is common to Olympic development. Amidst increasing rates of urbanisation, combined with economic growth pressures, a critical reading of the motivations which underpin urban infrastructure construction and mega-events is crucial. Although evidence indicates that it is not just cities in the global south where poor and marginalised residents may be removed under a pretence of Olympic development, the extent of precarious living conditions and rate of rapid growth in these cities ensures that an awareness of revanchist motivations is vital. Silvestre, G. and de Oliveira, N.G. (2012) The revanchist logic of mega-events: community displacement in Rio de Janeiro’s West End, Visual Studies, 27(2), pp.204-210, p.202. Silvestre & de Oliveira, p.208. Harvey, D. (2005) A brief history of neoliberalism (Oxford University Press), p.159. Raco, M., 2003. Remaking place and securitising space: urban regeneration and the strategies, tactics and practices of policing in the UK. Urban Studies, 40(9), pp.1869-1887, p.1869. Malfas, M., Houlihan, B., & Theodoraki, E. (2004) Impacts of the Olympic Games as mega-events, Proceedings of the Institution of Civil Engineers 17, p209-220, p.209. Gaffney, C. (2010) Mega-events and socio-spatial dynamics in Rio de Janeiro, 1919-2016. Journal of Latin American Geography, 9(1), pp.7-29.